Light is basic to almost all life on Earth. 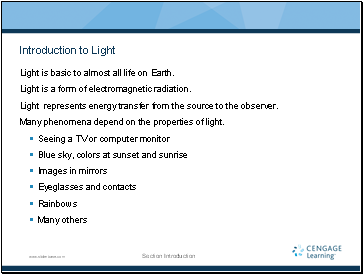 Light is a form of electromagnetic radiation. Light represents energy transfer from the source to the observer. Many phenomena depend on the properties of light. There are two historical models for the nature of light. The speed of light has been measured in many ways. Reflection and refraction are the fundamental phenomena in ray (geometric) optics. 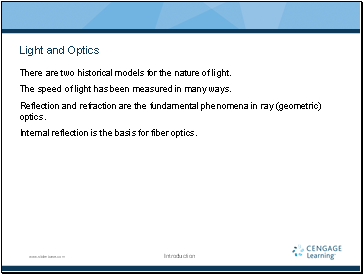 Internal reflection is the basis for fiber optics. 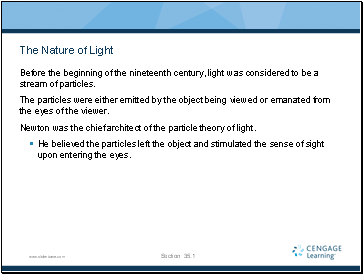 Before the beginning of the nineteenth century, light was considered to be a stream of particles. The particles were either emitted by the object being viewed or emanated from the eyes of the viewer. Newton was the chief architect of the particle theory of light. He believed the particles left the object and stimulated the sense of sight upon entering the eyes. 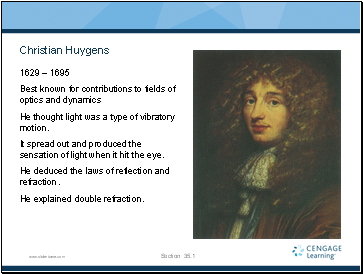 Christian Huygens argued that light might be some sort of a wave motion. 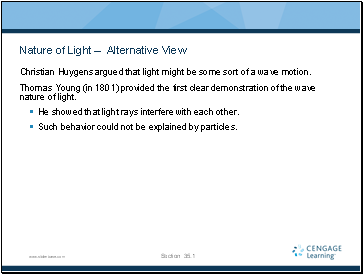 Thomas Young (in 1801) provided the first clear demonstration of the wave nature of light. He showed that light rays interfere with each other. Such behavior could not be explained by particles. He thought light was a type of vibratory motion. It spread out and produced the sensation of light when it hit the eye. He deduced the laws of reflection and refraction. 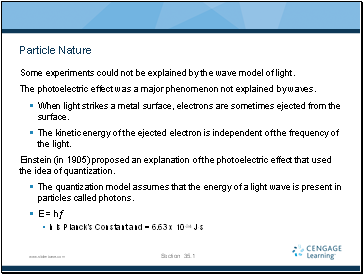 During the nineteenth century, other developments led to the general acceptance of the wave theory of light. Thomas Young provided evidence that light rays interfere with one another according to the principle of superposition. This behavior could not be explained by a particle theory. 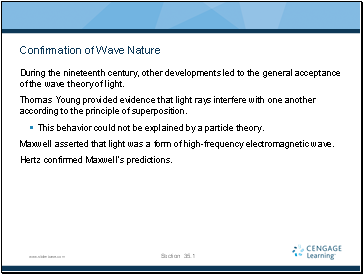 Maxwell asserted that light was a form of high-frequency electromagnetic wave. Huygens’s Principle and the Law of Reflection, cont. Huygens’s Principle and the Law of Refraction, cont.